How does your online giving experience compare to those of leading churches? We ran an experiment here at unSeminary: we set out to make $10 donations to 10 leading churches so we could learn from what others are doing. Each of these churches is fast growing and influential. We recorded the donation sessions so you can peek inside what it was like to give to them. We’ve also provided a copy of the giving receipt for you to see. Speed Matters // All things online should be fast. People are used to making quick decisions online and they want your website to be fast and responsive. Think through the steps between landing on your site and making a donation. Are there any “friction” points? Remove unnecessary steps in the process. Watch that you don’t require people to enter extraneous information that isn’t directly applicable to making a donation. Often, we want to use these interactions to collect information on people that might be helpful for other initiatives … resist this temptation. Think about it from your donors’ point of view. They want to make a donation and move on. Simplify every step to make it as easy as possible. Make It Obvious // Don’t make people hunt for where to give. We learned about this mistake a few years ago when we changed our website and put the “give” option on the top line of every page. Just making that change paid for the entire web redesign project in a few weeks because of the increased giving we received. 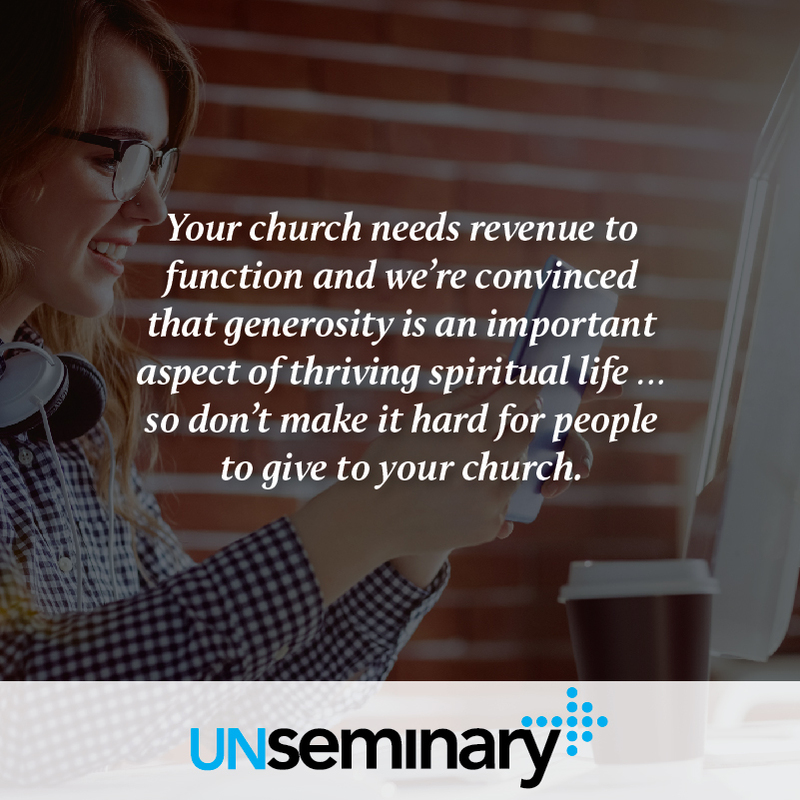 Your church needs revenue to function and we’re convinced that generosity is an important aspect of thriving spiritual life … so don’t make it difficult for people to give to your church. Build Trust // People are increasingly comfortable with online transactions, but we still need to build trust for donors. Provide easy access to your church’s financial statements close to your online giving tool, so people who want to dig deeper can do so. Many of these leading churches show logos of the card processing firms or security agencies they use, which gives a sense of trust. Look for grammar errors or typos … people will wonder about your ability to manage finances if you can’t manage to spell things correctly. User Account vs. No User Account // Some of these leading churches require people to create an account before making a donation, while the majority don’t. This is a decision to consider carefully for your church. By getting people to create an account, you ensure that you can do solid long-term follow up with them because they are in the database. However, this added “friction” slows down one-time donors. People will give you their email and phone number when they donate and you could use that data to drive your long-term follow up. Be cautious if you are going to require an account and ensure that you’ve counted the cost of limiting donations. From my seat, at the very least you need to provide an option for people to not sign in and just give. Giving Options Considerations // There are a number of options for how people can give to your church online: credit cards, PayPal, electronic funds transfer, e-check. Tread lightly, my friends! The more options you provide, the more difficult it is for people to navigate giving online. Narrowing the focus to a small number of options is a service that helps people make decisions. However, if you narrow too far down, you’ll miss a portion of your audience. For instance, you never see a merchant who only takes VISA because they know some people prefer MasterCard or Amex. They focus on those cards with the widest reach for their market. The same is true of the various online giving options. Someone might want to take advantage of e-check, but the space required to explain it might confuse or distract other people. I’ve found providing an “other options” tab or link helps with this tremendously! Keep Vision Accessible // Leading churches keep their vision in front of people constantly. They infuse it into as many different aspects of church life as they can. The online donation process is a great place to remind people of the good things that happen when they give to your church. Take time to thank people and show them how their giving makes a difference. Ensure the emailed receipt communicates why the church exists and thanks people for making a donation that drives the mission forward. Often, the financial department drives these processes and while they are functional, they can miss the opportunity to connect giving with the heart. But really, you use Internet Explorer?! Very informative as always! Thanks for pointing out the key issues to be aware of. It is something we must do in the near future. There are a lot of providers for processing these types of transactions. Any thoughts beyond what you’ve written on what to expect/beware of with these providers. If you covered it before, I’d like the link. 1) Which payment processors integrate closely with your Church Management System … you want to ensure that the data passes smoothly into that system. 2) Think “long tail costs” … what will this system cost you over the long haul. You want move a large percentage of your giving to online and think about what impact those percentage fees will have on your ministry. Negotiate up front to them lowered. We recently released a new giving app at NewSpring Church. Once you have an account and saved payment account, you can actually give in 10 seconds or less. Would you consider trying it out and giving your feedback? Are you guys finding it helping?